The Regenerative Brand Compass is used as a navigation tool to understand and grow a living brand. 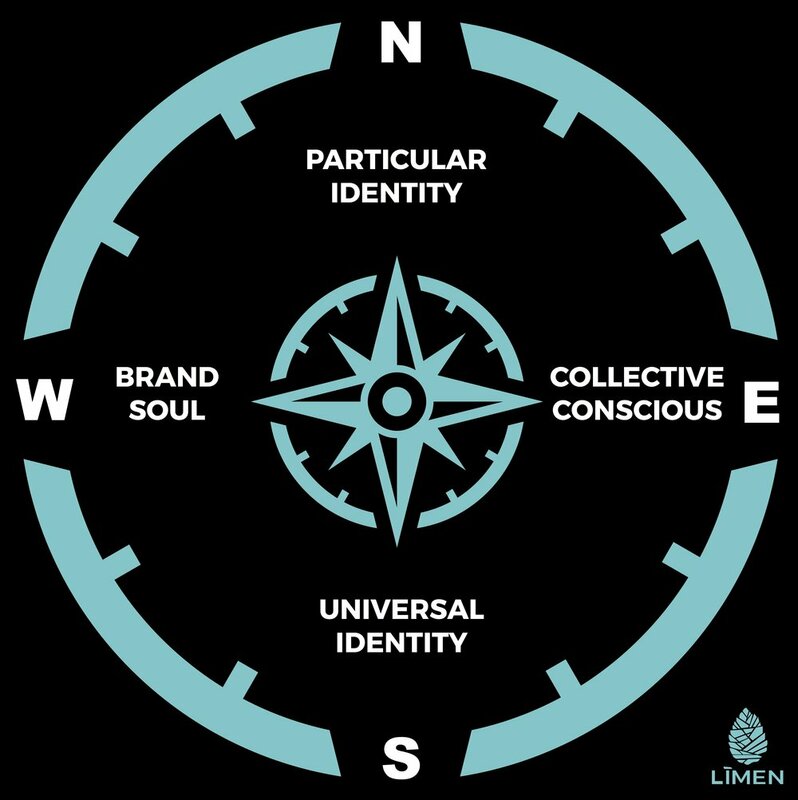 I developed the Regenerative Brand Compass to help navigate the many areas of a living brand and to ultimately understand the essence of the work at hand. Loosely based off of Ken Wilbur's Integral Theory, it is intended to foster depth, development, and movement in four areas: Brand Soul, Collective Conscious, Particular Identity and Universal Identity. These directions are meant to be frames for developing and understanding ourselves, our roles, and our psyches, both individually and collectively, interiorly and exteriorly as it relates to our evolving work. There is a universal cyclical pattern and flow between the directions that creates space for brands to adapt and evolve. The Brand Soul is the internal expression of the brand. It's the brand DNA and the ultimate place of essence from which everything is generated. Much like what the French would call élan vital, a creative force, the Brand Soul thirsts for union and authenticity, and gives an idea life, depth and meaning. When it is embodied, a brand works from a place of essence that is felt and impacted by everyone who experiences it. The Collective Conscious is the external expression of the brand. This aspect is where most branding efforts start and stop and often fall short of the gift that is received by intentionally focusing on the expansive metaphysical qualities of the Collective Conscious. Unlike Carl Jung's famous collective unconscious, we aspire to developing awareness of and within the unconscious of our customers, thereby making it conscious. A differentiating quality of regenerative brands is that they have built in reciprocity beyond themselves, and exude a life-giving essence on behalf of other greater and lesser wholes. This life-giving essence is acknowledged as innate within the brand and expressed among the Collective Conscious. Achieving this takes intentional practice and results in brand expansiveness. The Particular Identity is the individual expression of the brand. It is informed by the brand culture and expressed in the individual roles of the organization. Developing human capacity is imperative to successfully creating and evolving a Particular Identity. This practice is focused on having whole humans express the brand from a whole place. In order to do this, the brand's purpose must align with the values of the individual working on the organizations purpose. Qualities practiced within the individual are self-management, ego taming, vulnerability, and intention. The beauty of this holistic brand model is that it honors the intrinsic creative potential within every life. It weaves in the personal and professional development capacities of the individuals to become vital, willing, and able to evolve and impact the ongoing expression of the brand. The Universal Identity is the collective expression of a brand. When we are rooted in a universal identity as creatives, we are freed from mindsets of scarcity to become whole, integrated selves who live toward an abundant and mutually beneficial community. We work to see things as whole, each with it's own essence, embedded within greater and lesser systems. Too often brands are built on fragmented ideas. Too often the business landscape is oversimplified and dumbed down. The world, it's problems, and viable solutions are increasingly complex. I aim to help brands engage from a whole place, a place of univocity, where everything participates as one voice, consciously inclusive of social, economic, and ecological environments.